A baseball bat is a smooth wooden or metal club used in the sport of baseball to hit the ball after it is thrown by the pitcher. By regulation it may be no more than 2.75 inches in diameter at the thickest part and no more than 42 inches (1,100 mm) long. Although historically bats approaching 3 pounds (1.4 kg) were swung, today bats of 33 ounces (0.94 kg) are common, topping out at 34 ounces (0.96 kg) to 36 ounces (1.0 kg). Although using a stick to hit a ball is a somewhat simple concept, the bat is a complex object. It is carved or constructed very carefully to allow a quick, balanced swing while providing power. The bat is divided into several regions. The barrel is the thick part of the bat, where it is meant to hit the ball. The part of the barrel best for hitting the ball, according to construction and swinging style, is often called the sweet spot. The end of the barrel is not part of the sweet spot and is simply called the top, end or cap of the bat. The barrel narrows and becomes the handle. The handle is very thin, so that batters can comfortably grip the bat in their hands. Sometimes, especially on metal bats, the handle is wrapped with a rubber or tape grip. Finally, below the handle is the knob of the bat, a wider piece that keeps the bat from slipping from a batter's hands. Over the decades, the bat's form has become more refined. During the 19th century, many shapes were experimented with, as well as handle designs. Today, bats are much more uniform in design. The bat drop of a bat is its weight, in ounces, minus its length, in inches. For example, a 30-ounce, 33-inch-long bat has a bat drop of minus 3 (30 − 33 = −3). Larger bat drops help to increase swing speed. Bats with smaller drops create more power. In the American major leagues, Rule 1.10(a) states, "The bat shall be a smooth, round stick not more than 2.61 inches in diameter at the thickest part and not more than 42 inches in length. The bat shall be one piece of solid wood." Bats are not allowed to be hollowed or corked—that is, filled with an alien substance such as cork which reduces the weight. This corking is thought to increase bat speed without greatly reducing hitting power; however this idea was challenged as unlikely on the Discovery Channel series MythBusters. Both wooden and metal alloy (generally aluminum) bats are generally permitted in amateur baseball. Metal alloy bats are generally regarded as being capable of hitting a ball faster and farther with the same power. However, increasing numbers of "wooden bat leagues" have emerged in recent years, reflecting a trend back to wood over safety concerns. Metal alloy bats can send a ball towards an unprotected pitcher's head just 60 ft 6 in (18.44 m) or less away at a velocity far too high for the pitcher to get out of the way in time. Some amateur baseball organizations enforce bat manufacturing and testing standards which attempt to limit maximum ball speed for wood and non-wood bats. Aesthetically, wooden bats are generally preferred to metal, both for their traditional appearance and satisfying traditional "crack", far superior to alloy bats' hollow "ping". A Tony Gwynn game used and autographed baseball bat. Most wooden bats are made from ash. Other woods include maple, hickory, and bamboo. Hickory has fallen into disfavor over its greater weight, which slows down bat speed, while maple bats gained popularity following the introduction of the first major league sanctioned model in 1997. The first player to use one was Joe Carter of the Toronto Blue Jays. Barry Bonds used the bats the season he broke baseball's single-season home run record in 2001 and its career home run record in 2007. In 2010, the increased tendency of maple bats to shatter has caused Major League Baseball to examine their use, banning some models in minor league play. A baseball player may apply home run, because after comparing the length of the pine-tar treated area to the width of home plate (17 inches), the umpire determined too much of the bat was covered with pine tar. At the time, such a hit was defined in the rules as an illegally batted ball, the penalty for which is that the batter is declared out according to Rule 6.06. Nonetheless, at the time, the out call was challenged and overruled, and the game was resumed on August 6, starting after the now-upheld home run. Rules 1.10 and 6.06 were later changed to reflect the intent of Major League Baseball, as exemplified by the Commissioner's ruling. Rule 1.10 now only requires that the bat be removed from the game if discovered after being used in a game; it no longer necessitates any change to the results of any play which may have taken place. Rule 6.06 refers only to bats that are "altered or tampered with in such a way to improve the distance factor or cause an unusual reaction on the baseball. This includes, bats that are filled, flat-surfaced, nailed, hollowed, grooved or covered with a substance such as paraffin, wax, etc." It no longer makes any mention of an "illegally batted ball". In 2001, MLB approved the use of Gorilla Gold Grip Enhancer in major and minor league games as an alternative to pine tar. A wood baseball bat should always be used "label up" or "label down". Manufacturers position each bat's label over the mechanically weaker side of the wood. To reduce chance of fracture, and maybe deliver more energy to the ball, a bat is intended to be held so the label faces sky or ground when it strikes the ball during a horizontal swing. In this orientation, the bat is considered stiffer and less likely to break. For bats made of Ash, labels will generally be where the grain spacing is widest. For Maple bats they will usually be positioned where grain is tightest. Woods fracture differently. Maple bats in particular  were once known (circa 2008)  to potentially shatter in a way that resulted in many sharp edges, sometimes creating more dangerous projectiles when a bat broke. Maple bat manufacture evolved significantly, in cooperation with Major League Baseball, paying special attention to grain slope, and including an ink spot test to confirm safest wood grain orientation. A fungo bat is a specially designed bat used by baseball and softball coaches for practice. The etymology of the word fungo (pronunciation: ) is uncertain, but the Oxford English Dictionary suggests it is derived from the Scots fung: to pitch, toss, or fling. A fungo is longer and lighter than a regulation bat, with a smaller diameter. The bat is designed to hit balls tossed up in the air by the batter, not pitched balls. Typical fungo bats are 35 to 37 inches (89 to 94 cm) long and weigh 17 to 22 ounces (480 to 620 g). Coaches hit many balls during fielding practice, and the weight and length allow the coach to hit balls repeatedly with high accuracy. The small diameter also allows coaches to easily hit pop-ups to catchers and infielders along with ground balls due to better control of the barrel of the bat. A baseball bat may be used as a club-like weapon. During the 2011 England riots, for example, sales of baseball bats for self-defense rose greatly on Amazon.com. ^ "Bat-testing regulations modified" (www.ncaa.org/...) October 8, 2008. ^ "(National Federation of State High School Associations) Baseball Rules Committee Focuses on Clarification of Bat Standards and Sportsmanship During Pre-Game Practice" (www.nfhs.org/...) June 25, 2003. 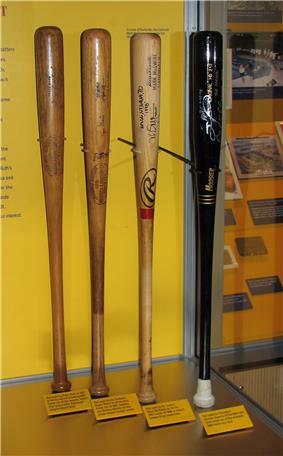 ^ "MLB bans use of many maple bats in minor leagues; safety concerns cited". Sporting News. Associated Press. 2010-03-01. Retrieved 2010-06-12. ^ Heiss Grodin, Dana (March 7, 2001). "Equipment and product guide". USA Today. Archived from the original on November 7, 2012. ^ "Wood bats - on which "side" should the ball's impact be? [Archive] - Baseball Fever". baseball-fever.com. Retrieved 13 September 2015. 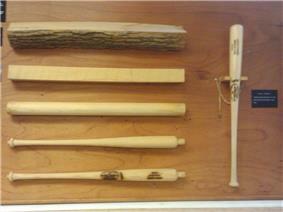 ^ a b "Safety tests for maple bats mandated". Major League Baseball. Retrieved 13 September 2015. ^ "Hitting with Wood". woodbat.blogspot.com. Retrieved 13 September 2015. ^ "Safety tests for maple bats mandated". Major League Baseball. Retrieved 13 September 2015. ^ Beaumont, Peter; Coleman, Jasmine; Laville, Sandra (2011-08-09). "'"London riots: 'People are fighting back. It's their neighbourhoods at stake. The Guardian. Retrieved April 27, 2012.